(177 x 269 mm) 11 x 14 in. SMALL 10 x 14.6 in. (254 x 372 mm) 12 x 18.5 in. MEDIUM 12.2 x 17.7 in. (310 x 450 mm) 16 x 24 in. Vajrasattva (Tib. Dorje Sempa), the 'indestructible being or hero', is an important Adi-Buddha and yidam deity, whose practice is particularly effective in purifying all defilements, especially those of anger and aversion. His visualized meditation practice and the repetition of his hundred-syllable mantra form one of the four 'preliminary practices' that are common to all schools of Tibetan Buddhism. White Vajrasattva is also frequently identified with blue Akshobhya or Vajradhara as the 'Lord of the Sixth Buddha-Family', the jnana or 'Wisdom Family' - the supreme source from which the 'Five Buddha Families' emanate. In this respect he embodies the forty-two peaceful and the fifty-eight wrathful deity cycle of the bardo mandala. As a lineage-holder Vajrasattva is the primordial source of transmission of the Atiyoga or Dzogchen teachings, where he originally manifested in visionary form to instruct the first human guru of the Dzogchen tradition, Prahevajra (Tib. Garab Dorje). 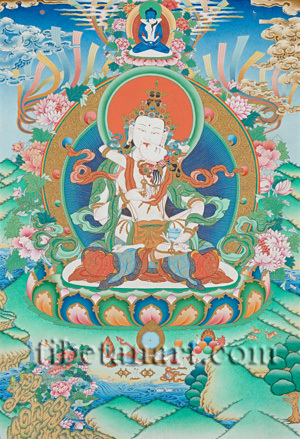 Vajrasattva is radiant and white in colour like the moon, with one face and two arms. He is endowed with the thirty-two major and eighty minor marks, and wears the five silk garments and eight jeweled ornaments of a sambhogakaya deity. He is beautiful and peaceful with a sweetly smiling face and two eyes, and he sits in vajra-posture upon a white moon disc and a multicoloured lotus. With his right hand he embraces his consort and holds a golden five-pointed vajra in front of his heart, and with his left hand resting upon his thigh he holds an upturned silver bell at the level of his hip. Vajrasattva is usually crowned with the small image of blue Akshobhya Buddha. In sexual union he embraces his white consort, who is known either as Vajratopa (Tib. Dorje Nyenma), or Vajragarvi, the lady of 'vajra-pride'. She sits upon his lap in lotus-posture with her legs encircling his waist, as she presses every part of her body against his. She is similarly adorned with the five divine silks and eight jewel ornaments of a sambhogakaya deity, and strands of her loosened long black hair hang freely down her back. With her two arms she embraces Vajrasattva's neck, with her left hand holding a skull-cup full of nectar, and her right hand hplding a vajra-handled curved knife behind his head. Golden light rays emanate from their bodies against the deep blue of Vajrasattva's inner aura, while his outer aura is composed of golden scrolls and jewels, which are encircled by a ring of rainbow light and a profusion of lotus flowers and leaves. Rainbows emanate into the clouds of the upper sky, while seated upon a moon disc and lotus above Vajrasattva's halo is the Primordial blue Buddha Samantabhadra in sexual union with his white consort, Samantabhadri. Vajrasattva abides within a beautiful landscape of green hills, lakes, rock formations, trees, flowers, deer, birds and fishes. Arranged in front of his lotus throne are various offerings of the five objects of sensory enjoyment (mirror, lute, fruit, cloth, and a perfumed conch), jewels, and the 'seven possessions of a universal monarch' or chakravartin. Vajrasattva's lotus and moon disc are traditionally generated from the syllables PAM and AH, while Vajrasattva himself arises from the white syllable HUM. Another small HUM syllable appears at his heart, with the hundred white syllables of his mantra circling clockwise around it. He may be visualized either as a single figure, or in sexual union with his white or red consort. Vajrasattva's purification practice essentially employs the visualization of a stream of white nectar, which flows through the 'aperture of Brahma' at the crown of the practitioner's head from the radiance of Vajrasattva and his hundred-syllable mantra that circles above. This nectar flows into the crown-aperture through the stem of the lotus upon which Vajrasattva sits, filling the practitioner's body with the white nectar of the wisdom, compassion and power of the deity. All obscurations and defilements are washed out through the pores of the skin and the practitioner's lower orifices, in the visualized form of pus, blood, scorpions, insects, snakes, and dark liquids. As these defilements ooze out of the practitioner's body they flow into an open chasm in the earth below, where Yama, the 'Lord of the Dead', waits to consume them with his open mouth, transforming all these poisons into nectar.